Plot: Robin of Locksley (Kevin Costner), a nobleman who joined King Richard in the Crusades, has been captured in Jerusalem. He escapes, saving the life of a Moor named Azeem (Morgan Freeman) in the process. Azeem returns to England with Robin, having sworn a life-debt to the Christian. Robin and Azeem return to England to find Nottingham under the thumb of its cruel Sheriff (Alan Rickman). The Sheriff rules with the aid of Sir Guy of Ginsbourne (Michael Wincott), the corrupt Bishop (the ironically-named Harold Innocent), and a witch named Mortianna (Geraldine McEwan), who fears prophecy of her death at the hands of a “painted man.” Robin meets with a childhood friend, Marian (Mary Elizabeth Mastrantonio), whose brother made Robin swear to protect her before dying in the Crusades. Robin’s father is dead and his home destroyed, and he and Azeem flee into Sherwood Forest to evade the Sheriff’s men. They encounter a band of outlaws led by Little John (Nick Brimble) and Will Scarlet (Christian Slater), who takes an immediate dislike to Robin. Robin takes the lead of the outlaws and begins training them to fight. As time passes, they begin robbing the coaches of noblemen, including that of a hard-drinking but able Friar Tuck (Mike McShane), who joins their party. Marian, realizing that Robin is fighting for the England of her absent cousin, the King, begins to quietly provide him aid. The Sheriff hires mercenaries to help him find Robin’s woodland hideout, capturing several of his men. He “proposes” marriage to Marian, the King’s cousin, saying he will space the captured outlaws if she accepts. One of the captives, Will Scarlet, deals with the Sheriff to track down Robin. When released into the forest, though, Will tells Robin of the Sheriff’s plans despite his anger with the man. Will reveals that he is Robin’s half-brother, the son of a woman Robin’s father took up with after his mother died. Robin embraces his brother, and together, they begin to plan. On the day of Marian’s wedding – which will coincide with the execution of the captives – Robin leads a rescue, setting them free. Azeem rallies the peasants to join them in overthrowing the Sheriff, and Nottingham erupts into war. The Sheriff rushes his “wedding” to Marian and takes her away, planning to consummate the marriage. As the Bishop tries to flee, Tuck faces him and loads him with treasure, pushing him from a window to his death. Robin saves Marian and kills the Sheriff, but Mortianna attacks him with a spear. Before she can strike her blow she is killed by Azeem, who has fulfilled his debt to Robin. Robin and Marian marry in the forest, a wedding only briefly interrupted by the return of King Richard (Sean Connery in an awesome cameo), who blesses them and gives Robin Hood his thanks. Thoughts: I was 13 years old the summer this movie came out, and although I know it gets a lot of grief from the Costner-haters of the world, it’s still a movie I really like. 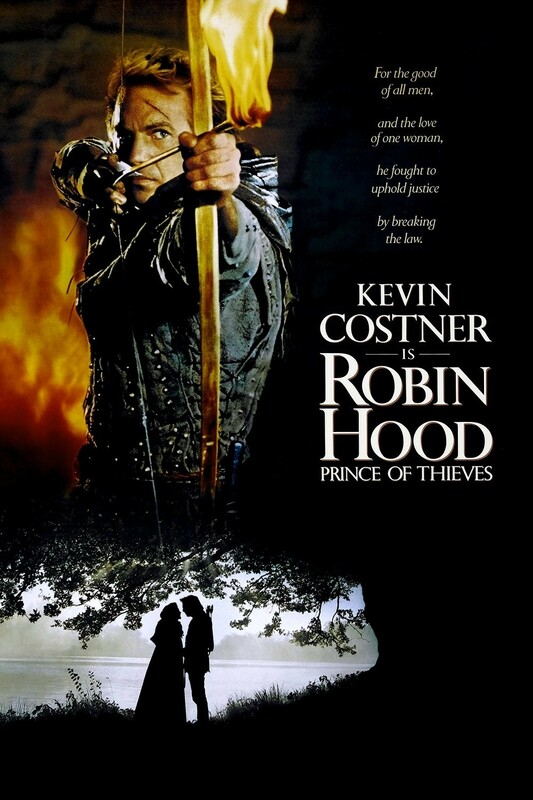 This was the first live action Robin Hood movie I ever saw, and as such it has greatly influenced my feelings about the character. Still, looking back at it 20 years later, I can see some of the cracks in the hero’s armor. Kevin Costner, to begin with, is slightly problematic. While I don’t hate the man, and in fact find his performance to be mostly effective, the fact that he doesn’t even attempt to sound English really does stick out like a Teletubby in a Goth Club. For all the good he brings to the role – a confident air, a dedication that feels genuine – the truth is I do have to force myself to ignore his lack of an accent. There’s an irony here – most linguistic scholars believe that the modern American dialect is actually much closer to 12th-century England than the speech patterns of the modern British. One could actually make the argument that Costner technically has the most accurate speech pattern in the film. Of course, I would then tell “one” to shut up, because that doesn’t change the fact that Costner still didn’t sound like anybody else in the movie. The rest of the cast, however, is impeccable. Morgan Freeman, who is as convincing as a Moor as Costner is as an actor being paid an enormous amount of money but still refusing to attempt an accent, steals the show as Azeem. He takes over the role of Robin’s second that is usually occupied by Little John, standing with him in the hardest moments and driving together the action when he draws his sword. His dry wit even brings a good bit of comic relief to the film. I would gladly have watched a film chronicling the further adventures of Azeem. But the prominence of this original character doesn’t really hurt Robin’s usual Merry Men. Mike McShane’s Friar Tuck is a riot and a lot of fun to watch, and to compensate for making Little John somewhat less of a central player than he usually is, the screenwriters introduced his wife (Soo Drouet) and family, giving him much more to do and much more at stake than he usually has. Drouet herself is a very strong addition to the cast – wry and boisterous, like a saucier version of Molly Weasley. Mastrantonio’s Marian… well, she’s not bad at all, but there’s nothing particularly memorable about he. She plays the part, she does what you want her to do. Alan Rickman, however, absolutely shines. We’re only a few years removed from Die Hard here, and he brings the same sort of nasty menace to the Sheriff of Nottingham as he did to Hans Gruber. When he threatens to cut out Robin’s heart “with a spoon” (“Because it’s dull, you twit, it’ll hurt more,”) damned if you don’t believe it. This is, without exception, my favorite rendition of the Sheriff of Nottingham of all time, the fiercest, the most frightening, and the most fun to watch. It may be because I was just at the right age when this movie hit, but it’ll always hold a soft spot for me. I can watch it over and over even today and always enjoy it, always get swept up in the excitement, and always feel ready to cheer for England’s legendary defender.